Everyone has their own additions and modifications to everything, just like me. 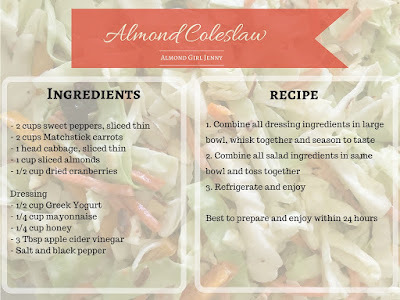 But I do have to admit that almonds really do go perfect with this recipe. 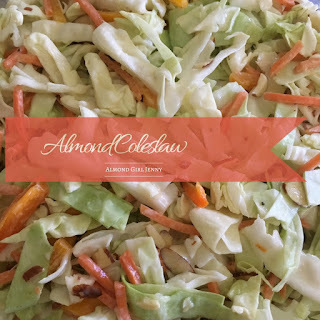 There is just something about coleslaw that is screaming out for almonds to be added to it. I also love that it is a simple recipe with 5 main ingredients. I am not a lover of mayo either, so I am always searching for mayo free recipes when it come to summer salads. Anything where I can substitute out mayo is a winner in my book. You will still need just a little, but trust me, you can't even taste it! So this Labor Day weekend, kick back, relax, and have a backyard bbq where you don't have to cook!